By being “lazy” I discovered that, in Klamath Falls, Oregon, Kale is a 2 year crop. We ate heartily off of it the second year because I never got it pulled out the first year. After that I pulled it because aphids and other bugs seemed to had moved in to stay, so don’t know if a 3rd year is possible. This year’s new plant in a new location just gave the chickens some winter greens. Mike let them out while he was rebuilding compost piles and they headed straight for the Kale. It’s back under snow now, but soon will be picking up with spring sun. We finished ours a month ago. Our above-snow plants got pretty frost-burned by Christmas, and the under-snow parts were welded to the ground by freeze-thaw cycles. Perhaps the key is a nice fluffy snow cover to moderate the harshness. 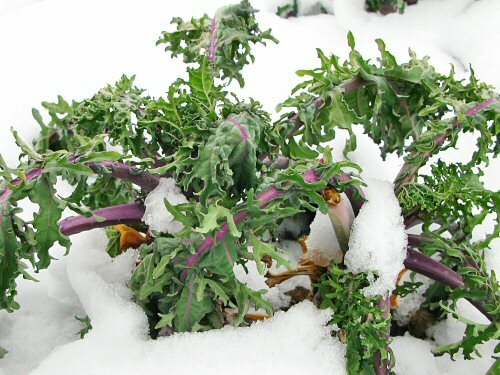 I feel like the urban intruder in all this…KALE?? I don’t think I’ve eaten that in … well, no idea how long. Joe’s pizza doesn’t deliver it, so (just kidding, we’re not quite that bad… though pretty close).